The Summer program follows the same general philosophy and guidelines of our 1st Church Preschool Program with support for social interactions and developmental activities in a child centered play experience in a mixed-age group. Our nine-week Summer Program follows the same general philosophy and guidelines as our 1st Church Preschool Program with opportunities for social interactions and learning through guided, child-centered, play experiences. Weekly themes provide the basis of a variety of planned indoor and outdoor activities and games. Children are provided opportunities to explore their natural environment creating a program around their own interests and needs. Summer cooking, art, and science activities keep children engaged and happy. Much time is spent outdoors on our large playground and backyard area. 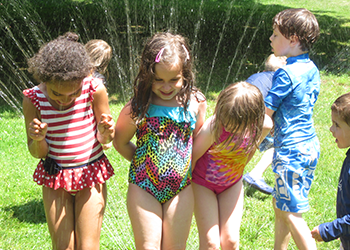 Water activities such as sprinklers and water tables are available to keep children cool. The program is primarily on site. Additional curriculum may be created around scheduled field trips, as long as transportation can be arranged. Our Summer Program is designed as a fun, yet educational experience where children can makes friends and enjoy all that summer has to offer. Our summer program is separate from our 10-month school year session with separate staffing and enrollment contracts. It is a multi-age level program open to all children ages 3 to 6 years (entering 1st Grade). Children do not need to be enrolled in our school year program to attend. This program offers a minimum enrollment of 2 days for two weeks, but can accommodate schedules of up to 5 full days for 9-weeks. Our summer program is staffed by our own early childhood educated teachers and when needed, additional support staff may be hired. Time (Full Day) 8:00 a.m. – 5:30 p.m.
Time (Mornings) 8:30 a.m. – 12:30 p.m.
A minimum of 2 mornings per week, for at least 2 of the 9-week program available. A minimum of 8 children enrolled each week is needed to operate. All schedules must be pre-arranged and be consistent weekly. You may sign up for any combination of 2 to 5 days per week– morning or full days. If you are interested in participating in our summer program please complete the Registration Form. Do not hesitate to contact us. Week 4 July 3 - July 7 Pizza, Pizza, Pizza Pie!